Bariatric surgery is the most effective therapeutic option for obese patients; however, it carries substantial risks, including procedure-related complications, malabsorption, and hormonal disturbance. Recent years have seen an increase in the bariatric surgeries performed utilizing either an independent or a combination of restrictive and malabsorptive procedures. We review some complications of bariatric procedures more specifically, hypoglycemia and osteoporosis, the recommended preoperative assessment and then regular follow up, and the therapeutic options. Surgeon, internist, and the patient must be aware of the multiple risks of this kind of surgery and the needed assessment and follow up. Background/Aims: Literature regarding safe doses of carvedilol is limited, and safe doses across different Child classes of chronic liver disease are not clear. Patients and Methods: A total of 102 consecutive cirrhotic patients with significant portal hypertension were included in this study. Hepatic venous pressure gradient was measured at baseline and 3 months after dose optimization. Results: A total of 102 patients (63 males, 39 females) with a mean age of 58.3 ± 6.6 years were included. Among these patients, 42.2% had Child Class A, 31.9% had Class B, and 26.6% had Child Class C liver disease. The mean baseline hepatic venous pressure gradient was 16.75 ± 2.12 mmHg, and after dose optimization and reassessment of hepatic venous pressure gradient at 3 months, the mean reduction in the hepatic venous pressure gradient was 5.5 ± 1.7 mmHg and 2.8 ± 1.6 mmHg among responders and nonresponders respectively. The mean dose of carvedilol was higher in nonresponders (19.2 ± 5.7 mg) than responders (18.75 ± 5.1 mg). However, this difference was not statistically significant (P > 0.05). The univariate analysis determined that the absence of adverse events, the absence of ascites, and low baseline cardiac output were significantly associated with chronic response, whereas, the etiology, Child class, variceal size (large vs small), and gender were not. On multivariate analysis, the absence of any adverse event was determined to be an independent predictor of chronic response (OR 11.3, 95% CI; 1.9–67.8). Conclusion: The proper optimization of the dose of carvedilol, when administered chronically, may enable carvedilol treatment to achieve a greater response with minimum side effects among different Child classes of liver disease. Background/Aim: In the present study, we aimed to compare the potential protective effects of thymoquinone and melatonin by using equivalent dose, on oxidative stress-induced ischemia–reperfusion (IR) injury in the intestinal tissue of rats. Materials and Methods: The study was performed using 32 male Wistar–Albino rats (weighing 180–200 g) randomly divided into four groups: Group I, sham group; Group II, IR group; Group III, IR with melatonin group; and Group IV, IR with thymoquinone group. After laparotomy, ischemia and reperfusion were performed for 60 and 120 min, respectively, on all the groups. 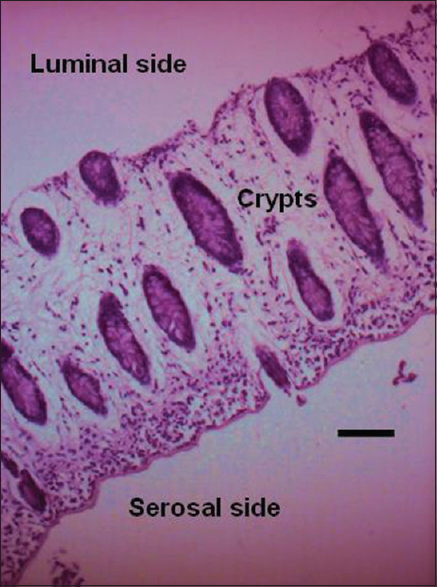 Intestinal tissue sections were stained using routine histological methods and examined under the light microscope. In addition, the sections were immunohistochemically stained using the TUNEL method for determination of apoptosis. Superoxide dismutase (SOD) activity, glutathione peroxidase (GSH-Px) activity, and malondialdehyde (MDA) levels in the intestinal tissue were also measured. Results: The IR group had significantly elevated tissue SOD activity, GSH-Px activity, and MDA levels compared with the sham group. Administration of thymoquinone and melatonin efficiently reduced these increases. Statistically significant number of apoptotic cells was observed in the intestinal tissue of IR group rats compared with the sham group. Treatment with thymoquinone and melatonin markedly reduced the number of apoptotic cells. Conclusion: The effects of melatonin and thymoquinone on IR-induced oxidative stress in rat intestines were similar. 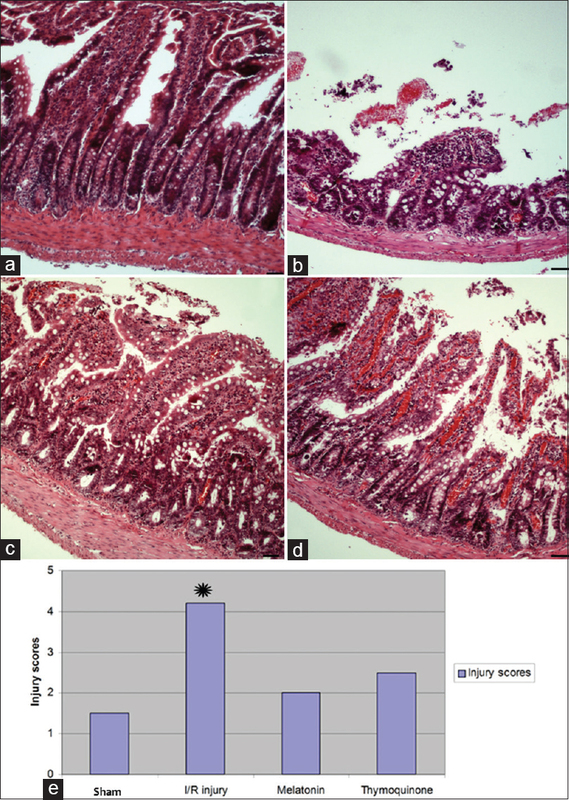 Our findings suggest that melatonin and thymoquinone protect against IR-induced injury to intestinal tissues. Background/Aim: Aerobic metabolism is necessary for ion transport in many transporting epithelia, including the human colonic epithelium. We assessed the effects of the epithelial sodium channel blocker, amiloride, on oxygen consumption and short-circuit current of the human sigmoid epithelium to determine whether these effects were influenced by the age of the subject. Materials and Methods: Segments of the sigmoid colon were obtained from the safety margin of resections performed in patients of 62–77 years of age. Isolated mucosa preparations were obtained and mounted in airtight Ussing chambers, fit for simultaneous measurement of short-circuit current and oxygen concentration, before and after blocking epithelial sodium channels with amiloride (0.1 mmol/L). Regression analyses were performed to assess the associations between short-circuit current, oxygen consumption, and age of the subject as well as to define the relationship between the decreases in short-circuit current and oxygen consumption after blockade. Results: Epithelial sodium channel blockade caused an 80% reduction in short-circuit current and a 26% reduction in oxygen consumption. Regression analysis indicated that both changes were significantly related (r = 0.884;P = 0.0007). Oxygen consumption decreased by 1 m mol/h/cm2 for each 25 m A/cm2 decrease in short-circuit current. Neither short-circuit current nor oxygen consumption had any significant relationship with the age of the subjects. Conclusion: The decrease in epithelial oxygen consumption caused by amiloride is proportional to the decrease in short-circuit current and independent of the age of the subject. Background/Aims: Tenofovir disoproxil fumarate (TDF) is a nucleotide analog used in the treatment of chronic hepatitis B (CHB) infection. This study evaluated the efficacy of TDF in achieving undetectable HBV DNA after 48 weeks of treatment in a Saudi cohort of CHB patients. 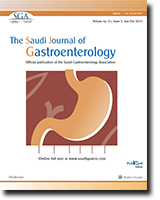 Patients and Methods: This retrospective study included patients treated at a tertiary care center in Saudi Arabia from January 2009 to December 2012. Of the 68 eligible patients, 51 were treatment naïve and 17 were treatment-refractory. Twenty-three patients tested positive for HBeAg. The remaining 45 patients were HBeAg-negative. Results: The mean HBV DNA viral load decreased from 95 million IU/mL at baseline to 263 IU/mL after 48 weeks of treatment (P < 0.001). 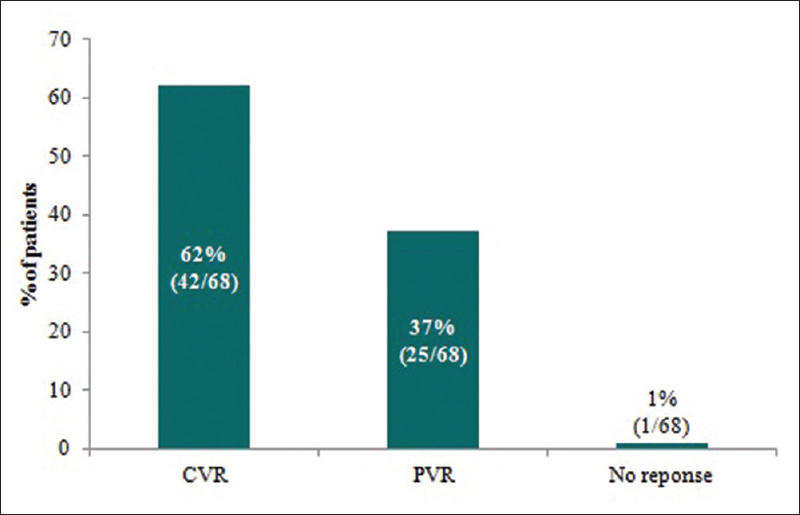 Overall, 62% of patients achieved a complete virological response (CVR) and 37% a partial virological response (PVR). Respective CVR and PVR rates according to subgroup were: HBeAg-positive (21.7% and 78.3%) and HBeAg-negative (84.4% and 15.6%). At 48 weeks, HBV DNA was undetectable in 66.7% of treatment-naÏve and 53% of treatment-refractory patients (P = 0.3). Seroconversion occurred in 13 (57%) of HBeAg-positive patients. Two (3%) of the HBeAg-negative patients lost HBsAg at follow up. Mean alanine aminotransferase decreased significantly from 134 U/L before treatment to 37 U/L at 48 weeks (P < 0.001). Significant adverse events were not encountered during the study period. Conclusion: Forty-eight weeks of treatment with TDF reduced HBV DNA to undetectable levels in more than half of our patients regardless of whether they were treatment-naïve or refractory. HBeAg-negative (vs positive) patients experienced a better response rate. Background/Aim: We aimed to analyze serum hepcidin level in children with chronic liver disease (CLD) and its relationship with serum cytokines level, liver function tests, hepatic iron content, and liver fibrosis. Patients and Methods: The study included 34 children with CLD, and 15 age- and gender-matched healthy children. Serum hepcidin, ferritin, iron level, interleukin-6 (IL-6), transforming growth factor-β (TGF-β ), total oxidant status (TOS), and antioxidant status (TAS) were studied in all patients and in the control group. Liver iron content (LIC) was measured from the liver biopsy specimen. Results: Serum ferritin levels were higher in patients with CLD than control group (100.1 ± 98.2 ng/mL vs 50.5 ± 32.2 ng/mL, P = 0.016). No significant difference was found in hepcidin levels. Hepcidin levels in children with CLD was positively correlated with ferritin (r = 0.75, P = 0.001), pediatric end-stage liver disease (PELD) score (r = 0.56, P = 0.001), TAS (r = 0.42,P = 0.02), but negatively correlated with albumin level (r = −0.45,P = 0.008). Transferrin saturation and hepcidin:ferritin ratio were significantly low in patients with severe fibrosis compared with patients with mild/without fibrosis (15.5 ± 5.5 vs 34.3 ± 30.1, P = 0.017 and 1 ± 0.5 vs 1.9 ± 1.4,P = 0.04, respectively). Conclusion: Serum hepcidin levels in children with CLD reflect both liver functions and TAS, and severe fibrosis is associated with low hepcidin:ferritin ratio in children with CLD. Background/Aim: To retrospectively assess the accuracy of intravenous (IV) contrast-enhanced multidetector CT (MDCT) in choledocholithiasis detectability, in the presence and absence of positive intraduodenal contrast. Patients and Methods: Over a 3-year period, patients in whom endoscopic retrograde cholangiopancreatography (ERCP) was performed within a week from a portovenous (PV)-enhanced abdominal CT were identified. The final cohort consisted of 48 CT studies in which the entire common bile duct (CBD) length was visualized (19 males, 29 females; mean age, 68 years). We identified two groups according to the absence (n = 31) or presence (n = 17) of positive intraduodenal contrast. CT section thickness ranged from 1.25 to 5 mm. Two radiologists, blinded to clinical information and ERCP results, independently evaluated the CT images. Direct CBD stone visualization was assessed according to previously predefined criteria, correlating with original electronic CT reports and using ERCP findings as the reference standard. A third reader retrospectively reviewed all discordant results. The diagnostic performances of both observers and interobserver agreement were calculated for both groups. Results: 77%–88% sensitivity, 50%–71% specificity, and 71%–74% accuracy were obtained in the group without positive intraduodenal contrast, versus 50%–80% sensitivity, 57%–71% specificity, and 59%–71% accuracy in the group with positive intraduodenal contrast. With the exception of the positive predictive value (PPV), all diagnostic performance parameters decreased in the positive intraduodenal contrast group, mostly affecting the negative predictive value (NPV) (71%–78% vs 50%–67%). Conclusion: PV-enhanced MDCT has moderate diagnostic performance in choledocholithiasis detection. A trend of decreasing accuracy was noted in the presence of positive intraduodenal contrast. Background/Aims: MiR-26a has been identified as a tumor suppressor in various tumors, but the relationship between miR-26a and the sensitivity of gastric cancer to chemotherapies has not been established. The present study was performed to investigate the effect of miR-26a on drug sensitivity in gastric cancer (GC). 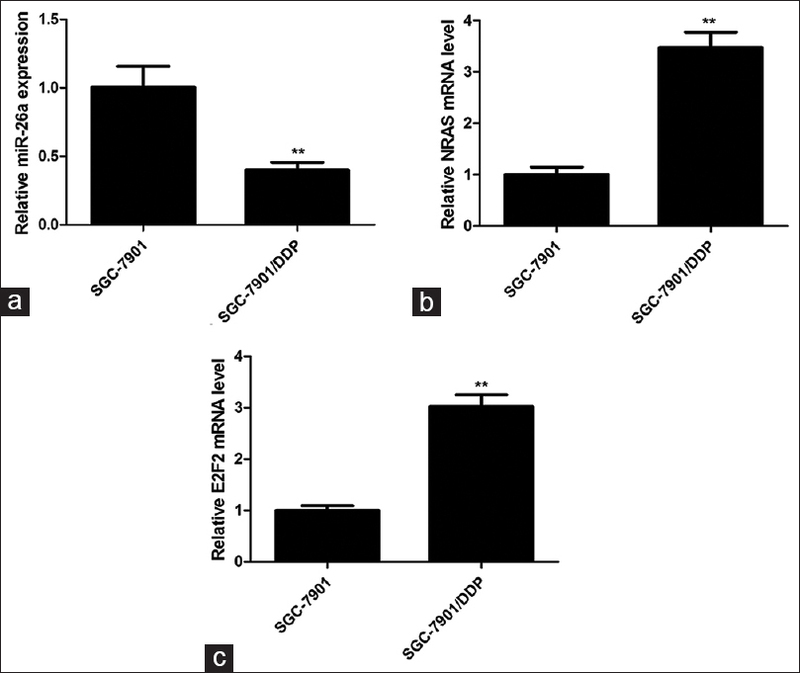 Materials and Methods: The expression level of miRNA-26a in cisplatin-resistant SGC-7901/DDP cells and parent SGC-7901 cells was evaluated by qRT-PCR. The effect of miR-26a on sensitivity of GC cells to cisplatin was assayed using MTS method. The effect of miR-26a on cisplatin-induced apoptosis were determined by Annexin V/propidium iodide (PI) double staining method and flow cytometry. The targets of miR-26a were identified using a luciferase activity assay and miR-26a-mediated target genes expression analysis. Furthermore, the role of the targets neuroblastoma RAS viral (v-ras) oncogene homolog (NRAS) and E2F2 on sensitivity of chemotherapy in GC by MTS and apoptotic cell analysis was assessed. Results: We found that miR-26a was downregulated in cisplatin-resistant SGC-7901/DDP cells compared with SGC-7901 cells. Using both gain- and loss-of-function analyses, we further revealed that miR-26a could improve the sensitivity of GC cells to cisplatin. Furthermore, miR-26a has target sites in the 3′-UTR of NRAS and E2F2 by luciferase reporter assay and reduces the expression levels of NRAS and E2F2. In addition, knockdown of NRAS or E2F2 sensitize GC cells to cisplatin. Conclusion: Our results suggest that miR-26a can improve the sensitivity of GC cells to cisplatin-based chemotherapies through targeting NRAS and E2F2, and provide the first evidence of the potential utility of miR-26a as a sensitizer in chemotherapy for GC. Background/Aims: The association between platelet–lymphocyte ratio (PLR), neutrophil–lymphocyte ratio (NLR), and survival with response rates were evaluated in metastatic gastric cancer (MGC). Patients and Methods: MGC patients on firstline modified docetaxel/cisplatinum/5-fluorourasil [mDCF; docetaxel 60 mg/m2 (days 1–5), cisplatin 60 mg/m2 (day 1), 5FU 600 mg/m2 (days 1–5), q3w] were evaluated retrospectively. The cutoff values were 160 for PLR and 2.5 for NLR. Progression-free survival (PFS) and overall survival (OS) were estimated for group I (PLR >160), group II (PLR ≤ 160), group III (NLR ≥ 2.5), group IV (NLR < 2.5), group V (PLR > 160 and NLR ≥ 2.5), group VI (PLR ≤ 160 and NLR <2.5), and group VII [VIIa (PLR > 160 and NLR < 2.5) and VIIb (PLR ≤160 and NLR ≥ 2.5)]. 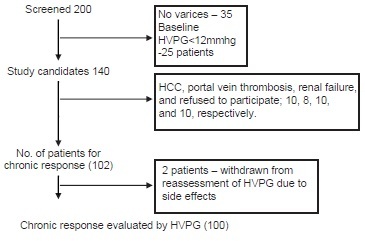 Results: One hundred and nine MGC patients were evaluated for basal hematological parameters and survival analysis, retrospectively. Most of the patients were male in their fifties with grade III adenocarcinoma (62.9%) and liver metastasis (46.7%). Patients with PLR > 160 and/or NLR ≥ 2.5 had significantly shorter PFS and OS (P = 0.04, 0.01, 0.019, and P = 0.003, 0.002, 0.000, respectively). Conclusion: High PLR (> 160) and/or NLR (≥ 2.5) seem to be poor prognostic factors in MGC. Background/Aim: Proinflammatory markers such as interleukin (IL)-6 have been closely associated with atrial fibrillation (AF). These markers are characteristically elevated in chronic inflammatory bowel disease (IBD) and positively correlate with disease activity. Although IBD and AF have similar pathogenesis, there have been very limited studies looking at their association. The aim of this study is to determine the prevalence of AF in patients with IBD. Patients and Methods: Medical records of patients with biopsy proven IBD (n = 203, both in and outpatient) were retrospectively reviewed. One hundred and forty-one IBD patients with documentary evidence of electrocardiograms (ECG's) were included. The "Anticoagulation and Risk Factors in Atrial Fibrillation (ATRIA)" study, a large cross-sectional study (n = 1.89 million) done to evaluate the prevalence of AF among the US population, was our control population. All ECGs available till December 2010 for each IBD patient were reviewed carefully for evidence of AF. 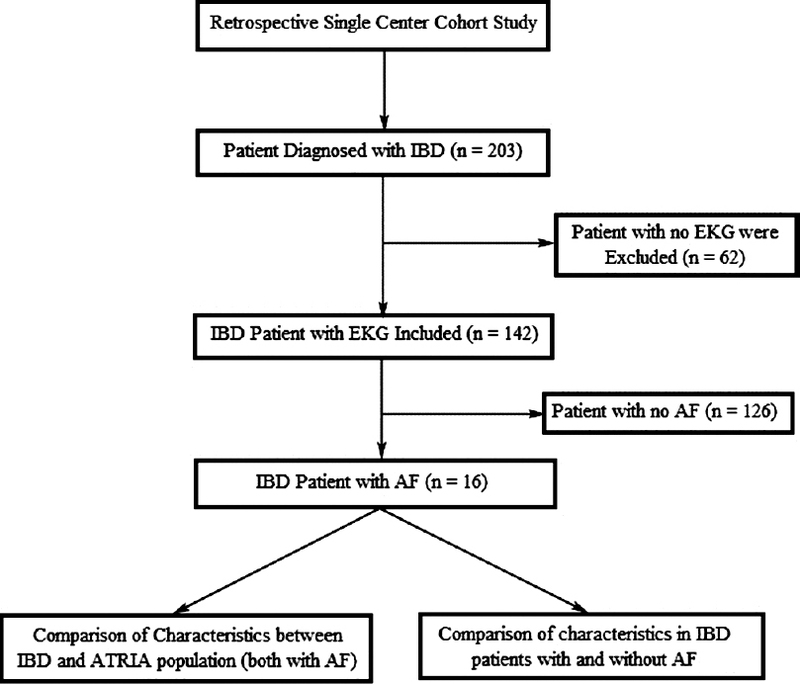 We studied the prevalence of AF among IBD population and compared it to that of control (ATRIA) population. Results: The prevalence of AF was significantly higher among IBD patients compared with the ATRIA study patients (11.3% vs 0.9%, P < 0.0001). Additionally, the IBD patient population were much younger compared with the controls (64.4 ± 10.7 vs 71.2 ± 12.2, P = 0.02). Conclusion: AF has an overall higher prevalence across all age groups in IBD compared with the subjects of ATRIA study, which could be due to the chronic inflammatory state of IBD. Further studies are needed to study the association in detail. Background /Aim: Narrow band imaging (NBI) is a novel, innovative high-resolution endoscopic technique, which utilizes spectral narrow band filter for the visualization of mucosal patterns and microvasculature. Nonerosive reflux disease (NERD) is a type of gastroesophageal reflux disease (GERD) and it is characterized by reflux symptoms without mucosal breaks on white light endoscopy (WLE). Biopsies from distal esophagus of GERD patients show group of histologic features such as basal cell hyperplasia, elongation of lamina propria papillae, and inflammatory cells. The present study was undertaken to evaluate diagnostic utility of NBI endoscopy and biopsy study in NERD patients and also to correlate NBI endoscopy findings with histologic features of GERD. Patients and Methods: A total of 71 cases of NERD having symptom score more than 10 and those not having erosion on WLE were recruited prospectively and underwent NBI endoscopic examination. Two mucosal biopsies were taken at 3 cm above the squamocolumnar junction. Results: Histologic features of GERD were seen in 50 (70.4%) out of 71 cases. No significant correlation between NBI endoscopic findings with histologic features of GERD was found. Conclusion: The present study showed that histopathologic evaluation of distal esophageal mucosa has promising diagnostic value over NBI endoscopy in NERD patients. Use of newly introduced NBI technique requires tremendous familiarity for the detection of the cases of NERD, which show histologic features of GERD. We present a 37-year-old lady who had liver transplantation for hepatitis B cirrhosis and was on immune suppressive treatment consisting of mycophenolate mofetil (MMF) and tacrolimus. She presented with undue fatigue and recurring pain in both arms. 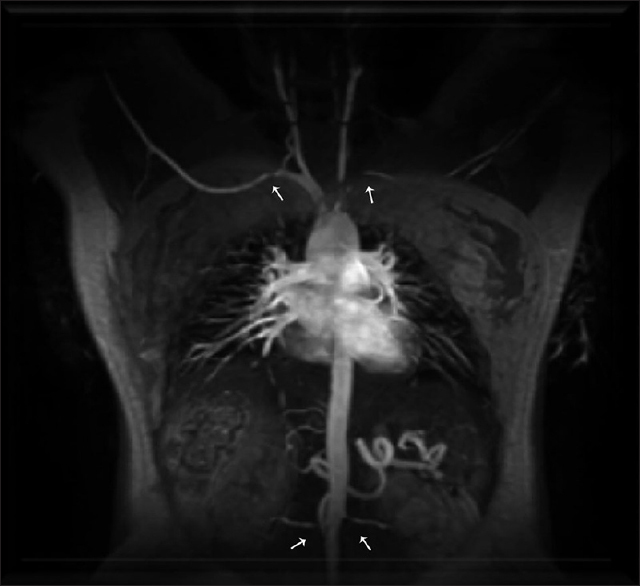 The diagnosis of Takayasu's arteritis was made, supported by angiographic findings of significant stenosis of the left subclavian and both renal arteries. She was managed by adjusting the immune suppressive medications and underwent a successful percutaneous transluminal balloon angioplasty (PTBA).